I have been carrying this bottle on all of my Long runs for the past 3 months and I LOVE it! Light weight, perfect size pocket, and easy to use hand strap combine to make you feel like you are not holding water. That covers the cost of the most expensive RoadID, the Elite Wrist RoadID and its shipping and handling. This wrist Elite ID can be accessed by the EMS -either through a phone number on the ID or the online login provided on the ID -and you will have already provided all your info such as allergies, contacts, hospitals, blood types, etc. Its super easy for medics to get all the info they need from you in a hurry and in the event of an emergency. Or you can use the money on any of the following GREAT products. Visit their Website to see other great safety gear HERE. With 2x Caffeine and a rockin Blackberry flavor this purple packet is essential for running. I tested this flavor before 2 hours of volleyball and I can tell you it WORKED! 1. Leave a Comment and let me know why you would like to WIN. 2. Visit the websites of the generous sponsors Golite HERE, RoadID HERE and Gu Energy HERE. Leave a Comment on what you think about the website, products or anything you found interesting. Up to 3 entries. 3. Tell your friends. Link back to this Giveaway on your Blog, Facebook, Twitter or just tell someone you know and let me know in a Comment. Limitless entries, so link away. 5. Answer the question: What is your Running Essential? Leave a Comment. ****Many ways to enter... and if you know Tall Mom there MAY be multiple winners. I would like to win cause I could always use some GU and I REALLY really REALLY want a RoadID! I love Golite stuff. They have an awesome website. I like how easy it to navigate and I like the different pictures/sayings that scroll along on the homepage. I love Tall Mom giveaways!!! Just went to the Golite website and had no idea they did clothing as well! I have never tired Gu but would also love the Road ID ecard! 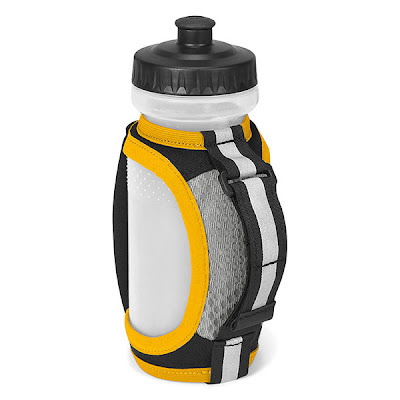 My running essential is already the Golite Hydroclutch handheld waterbottle! Couldn't get by without it! I would love a new one, with the Interactive! I have tried GU in the past and had a hard time getting it down due to the texture. However, I have heard such great things about it that I have been meaning to give it another try. Plus, the blackberry flavor sounds like it's super yummy! I am a GU girl! Although, I am very true to my flavors - Vanilla and stawberry chomps! I really should branch out, and Aron did a great review on the Jet flavor - would love to try something new!!! My running essential is definitely my Garmin. I love it! I put a link for your Marathon for the Cure at the top of the page - hope this helps!! I want to win! I really want a Road ID, it's been on my priority list for awhile. My running essential is good socks. I get blisters way too easily, so I'm picky about my socks especially for treadmill and long runs! I just donated to your cure page!!!!! it made me so happy, too :) if i had endless money i think i would donate to someone/something every single day. I would like to win, because my job is driving me crazy, and a running prize pack would make me smile!!! I need a road id, I have been looking at one for some time, this one looks awesome! GU is awesome, and I love backberries, enough said. I love GoLite gear. Everything that I have ever gotten from GoLite has been ultra durable!!! My running essential right now is my shoes, obviously most people wear them when they run. But apparently the wrong shoes have been the culprit to all my problems. The Nathan name has become synonymous with high quality hydration. I have a Nathan hydration belt, but think that the hand-held would be much better suited for me. I love Gu. It has gotten me through many tough races! I like the Road ID company because their products are reasonably priced! I would love to win the hand held water bottle. I just bought one for a friend for her bday, but not for myself. Sometimes i feel bad spending money on myself and on running. i like the golite hand-held bottle. i've had somein the past but i always lose them! maybe if i had the right 1 i wouldn't lose it! Love Gu! I have been using the Expresso Love because it has 2x the caffeine, but I didn't know that the Jet Blackberry had 2x also. Definitely have to give this a try! I WANT TO WIN :) just because, I LOVE all that stuff!!! and I NEED a road id badly! the new blackberry gu is my favvvvv! Howdy! I would love to win because all this cool running stuff is awesome! And because carrying my drivers license this morning in my spi belt was a real drag. :) I'm thinking my luck may have run out already since I just won some awesome Recovery Socks, but I'm going to try, darn it! I would love to win these products because I am taking up trail racing this year. I have been searching for a bottle to carry but haven't pulled the plug on a purchase yet. Also I will be running trails so the Road ID will give me peace of mind. My running essential is my SpiBelt. I love that thing! I've been eyeing up the Road ID for sometime now. Haven't decided if I want the interactive or not...heard pros and cons both ways. I better make a decision soon because I'm definitely getting one this year though since I'll be hitting some trails. Oh, I want to win!!! First, I’m a water girl and I’ve been eyeing a couple handhelds for a while. I’m even debating with going to go so far as to put some options on my blog for family members to look at in hopes I get one for my birthday. Second, I won’t run without my RoadID. Third, gel is a necessary part of fueling when running, so it is obviously wanted and needed. GoLite’s site works well once you figure out the full collection is across the bottom. I’d love to try some of their women’s trail running shirts. RoadID is amazing and I won’t run without mine. I use the shoe ID and would love another RoadID because I don’t always have the same pair of shoes on so I have to keep moving my ID. GU Chomps are the best of the GU products, probably because I haven’t figured out how to open and take gels on the move yet. I wish the chomps were in more flavors, just like the gels. I like that Hydro clutch. Especially like the fact that there's a pocket for a few extras. Could be a quick fill option for shorter races, but probably will need something more for ultras. I love their sleek slipstream pack. Thanks for turning me on to this company!!!!!!! Oh, and my running essentials are Nike+ and a cute outfit that makes me look like a serious runner (even though I'm just a beginner). My running essential: GU and NUUN! Without Gu, there are some runs I never would have gotten through. And without NUUN, I would be in a world of hurt - I get massive headaches when my electrolytes are too low. LOVE both of these! Other than the obvious (shoes & clothing), when I'm outdoors my running essential would be my sunglasses. I've been known to wear them on the top of my head if it is dark because they are essential to running. I want to enter and I follow! my running essential is a positive attitude! I don't have a road id, and I could use one! Last June my husband was hit by a car while on a training ride. Thankfully he is now okay and just starting to get back into riding. I would love to win so I can get Road ID for him, because if he hadn't come around to let someone know who to call. Who knows when I would have found out. my running essential is comfortable running clothes. when i dont feel comfortable in what im wearing, it will bug all through my run. I'd love to win, especially if it involves a cute new color road id and I definitely want to try the Blackberry GU or get some of the Blueberry/Pomegranate Gu Roctane! My running essential is HANDS DOWN...my running shoes and custom insoles! They save my over-pronating plantar fasciitis feet! GO-LITE: I love their "Less is More" business model - they offer a good reminder to "lighten up" when it's so easy to get caught up in "stuff" with our sport. I have my eye on their base later tops and soft shell jacket... NICE! ROAD ID: Well, I recently hosted my own Road ID Giveaway so I am a big fan. I love that so many big name athletes wear Road ID proudly. This is an amazing product and so important. GU: I absolutely love Gu... by far my favourite energy source for long runs. They make the most flavours, the consistency is JUST right, not too much volume.... LOVE LOVE LOVE Gu! I've donated to your Susan G. Komen Breast Cancer page... will link you up later this week! What is my running essential? I can only name one.... Hmmmmmmmm! Besides the obvious (shoes, clothes, water), I would have to say my Garmin. I love knowing my stats, hearing the beeps as the miles tick by. I'd feel so lost without it. Linking you in my post today. Putting your link on FB! Oh the coverage you will be getting! I want to win because well...I really need a road id. There's no excuse except being a poor college student who spends too much money on race entries. i would like to win because this is a totally awesome giveaway! went to GoLite... i love that they will take back any GoLite products and repurpose it! totally awesome! I would like to win, because everyone needs a ROAD ID. Listen up people- my cousin was at work one day and gets a phone call notifying him that a woman matching his wife's description was struck by a car near their house while running. Sadly, my poor cousin endured about 20 minutes before finding out the victim was misID'd as his wife Kay. So please, get a road ID so that if anything ever does happen to you, you can get the proper care and your In Case of Emergency Contact is reached immediately! running essential - people. i run so much better when there is someone else running "with me".. they don't have to stay with me, i just need to know they are there. um... sort of gross but pretty cool. if you save your gu gel packets and send them back to GU - they'll make a donation to a charity for you! I'm thinking I'm gonna get one of the Golite camelback things. I'm not a fan of things around my waist or holding things while I run. I LOVE GU! Mint Chocolate is my fav! I linked you on twitter! I would love to win! I know the Road ID would make my worrier hubby happy. I linked this from my blog. I also tweeted about your donation page! Just checked out the GoLite site and seriously love the photo on the homepage. I just wish you didn't have to use the scroll bar to see other items. Oh Road ID ... thanks for naming the light the Firefly. I want if only because it's called a firefly and makes me think of summer. 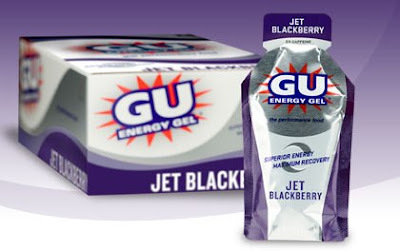 Visited the Gu site and found that the new Jet Blackberry has twice the caffeine. Yay for caffeine! Linked to giveaway on Facebook. I would love any of these running essentials! I am just learning to run, and I think all of these would help in my training for and running in a 1/2 marathon in May!! Thanks for the great giveaway!! I never realized GoLite has so many products! I'm loving looking through their site at everything. I've been scoping out the Road ID for a while now, but just dont have the money to buy one. Instead I carry my phone and actual ID which isn't nearly as easy! I used the Vanilla Bean Gu in my run this weekend and it was great. So far it's the only one I've tried, so I want to branch out and check on some of the other flavors that look good. Maybe Capuccino and Chocolate. My name is Sandra and I'm from the Netherlands. I would really like to win a RoadID giftcard because I can use none of RoadID their standard payment methods because I always pay everything (international) with paypall and they don't accept that. So I would really like a gift card! I need to win because these items may motivate to run longer distances - I have only competed in 5ks. I have donated to your cause! I have linked on my blog to support your cause! Road ID: I need another one for my cycling shoes. I could use a handheld GO Light bottle. Summer is coming up. Chocolate GU all the way. That's just how I roll. My running essential is a moving comfort sports bra. I can run with just about anything else. My husband would like me to wear the RoadId - he worries when I run. i want to win because I am too cheap and lazy to order a road ID when I know I NEEEEED one! And I am too lazy to go to the store to buy GU. But if I win you can keep the handheld....unless you want to give it to me to give away on my blog but since I just totally dogged the handheld bottle my readers may get a little huffy at me for trying to give them one! Ha ha!!!! I must say the pocket was nice, it held my GU and my key. but I just need my hands too much. I donated to your Race for the Cure. I made a button for your Race for the Cure on my blog. I have never tried Gu... but would love too. I have entered like 12 giveaways for the Road ID... but have never won. I hope this time is a winner. 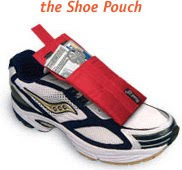 I would like to win, because I am in dire need of a waterbottle, and instead of a little pouch on my shoe, I run with my car key inside my glove! My Running Essential is my ipod and chapstick! I'd love to win because I would really like a GoLite handheld waterbottle for my runs. My running essential is chapstick. It's pretty much my life essential. I've donated to your cause at Marathon for the Cure! On the GoLite website I really like some of the hydration and daypacks that they have to offer. I'd like one for hiking! I haven't been to the Gu website until today, and I found a lot of new products that I'd like to try. I'd like the Gu Recovery and Gu Electrolyte products. I would love to win because as you stated the cost of running supplies add up, plus my FAVE GU flavor is Jet Blackberry and I really want a road ID for my long solo runs. I linked to your donation page, a fantastic cause! I love the GU Website, it is so easy to navigate and before I had ever tried GU I went on there to read about all the different products. I would like to win b/c the summers here in the midwest are very humid and I ALWAYS need to be able to stay hydrated while I run. So, the GoLite would come in very handy to me. I'd like to win because I really am bad about hydrating when I run and have been needing to by a Go Lite (and even have thought while running of this blog and how much you like yours). I love all of the websites. Layouts work nicely, and love the variety of colors (Road ID - I have one in Red already) and flavors (GU). Running essentials - running shorts, HR monitor and watch, a nice day, and my running shoes! I would love to win because I need all of those things on your awesome giveaway list!! I am hoping to win them instead of buying them this season!!! I really like the road ID. It would make me feel safer since I run alone. It would be interesting to try the Gu. I have not ever had it! I looked at all their flavors on their site and think they sound yummy! I like the design of the Golite and think it would be comfortable to hold for long runs! I would like to try the GU stuff I would aslo like a road I.d. I checked out the Road ID site and like the elite band in blue the best! My running essential is my phone but a road Id would be an added measure comfort for my piece of mind! I also like to take dried dates with me on a long run and an electrolyte cap and water! I mentioned this website and giveaway to my friend at my son's therapy! I shared the link to the Marathon for the Cure link! As always great giveaways Mel! I would like to win because purple is my color! And also because I came face to grille with a Hummer on an icy road the other day. Would have been nice to have a Road ID in the unfortunate event we actually connected. I linked your giveaway on my blog. My running essential is good old H2O! I'd like to win 'cause I've never tried Gu and want to. And I know I need a Road ID. I need to win the Road ID because I run way too much by myself! I would like to try to new Gu-and the hidration bottle would be more comfy than my fuel belt! I need to win b/c Gu and waterbottles are essentials and I've been wanting a new handheld and GU is always something on the REI list. As for the ROAD ID---both my hubs and I should get one so this would be a great gift card for us. GoLite has an amazing and easy to use website. I really enjoy the brightness of it---hard to describe but it feels clean. We know I love their products! RoadID--I'd actually say their homepage is a little busy. However, the navigation bar on the side is easy to use and directs you to their various products. Gu's website makes me want to eat a Gu and I'm sitting at my desk =). Well done marketers. My running essential is strong positive attitude. When my heart is in it---I run faster and stronger. Other essentials are my awesome Saucony shoes! I really want the Road ID. I almost ordered one today and since I run on roads and highways usually alone, I really need one of these. I went to the Road ID website, and I really like how they offer all the suggestions of how to personalize your Road ID. I went to the Gu site and I'm amazed by all of the different flavors! Last but not least, I checked out the Go Lite website and since I am in the market for hydration stuff, I think Im definitely leaning toward them now. I did a $15 donation to enter your virtual race!! I would like to win because I would love to own the Golite Hydroclutch waterbottle. It looks perfect for my long runs...plus I love me some Gu! My running essential is my Under Armour wear! I LOOVVVEE Under Armor! oh yeah, and my I-Pod! I went on Golite's website, and didn't know that they also carried clothing. There trail running wear looks awesome! I LOVE GU and have been using it since I started running...Would love to try blackberry! I went on Road ID's website and see that they carry the ID in pink and purple...LOVED THEM!!! So super cute! Wouldn't it be fun to have one in each color to match each running outfit!?!? Ok getting started here!! I would really like to win the Road ID. I also really want a hand held too BUT i am thinking safety first and Road ID is the best. I don't have one and I should since I run in the mornings so much! The rest of the stuff would just be an added bonus and i have never tried gus so I would like to! I know exactly which Road ID I want, from the site its the Wrist ID elite that way it wont get stinky because its made of rubber! If I had unlimited money I would buy a TON of Golite stuff because really it is awesome and I love their website! Im linking to the giveaway in my post tomorrow morning!! Wow, awesome giveaway Tall Mom!!! Thanks! Why would I like to win? I definitely need a new hydration system as I'm not fond of my current pack. Plus I could really use all of the Blackberry Gu during Ironman training! Gu Energy...what can I say? I love the stuff. It is one of my favourite gels and I'm super excited that chocolate mint is now a full time flavour. Love the chomps, and I'm hoping to try the recovery beverage sometime soon! What is my running essential? My Asics Kayanos. I love those shoes and can't imagine running in something else. I posted this to Twitter! I need this wonderful stuff because I need to be so well stocked and prepared for the ultra. i'm slowly trying to acquire stuff as I go along b/c it adds up!! My running essential...sports bra. No way could I run without it! I would love to win, especially the Road ID! I really need a bottle to run with, too, so the water bottle would be great. Thanks! I want to win mainly because I like to win ... you know me and competition are best buds! Plus, I would be passing some of this off to the hubby who is training for a half. My running essential is chewing gum. Silly. I know. Ok - Road ID - I love that their website is so casual. Like you are taking to your best running mate. What I want from them is the woman's cycling shorts ... getting back into tris this summer! GoLite - I really love their Wildwood Trail Longsleeve 1/4-Zip Run Top ... super cute! Gu - Still haven't tried it. G has yet to share her's. On the website, I love the athlete bios ... super interesting facts. You are linked on the blog! my running essential ... sweet socks and my running skirts! I would like to win because I was just telling my husband this weekend how I need to get a handheld water bottle for my runs. I hate wearing a fuel belt, it makes my tummy itch.